Pedal Force One win Stage7!!! Sinetairoi do not seem to lose the orange shirt!! 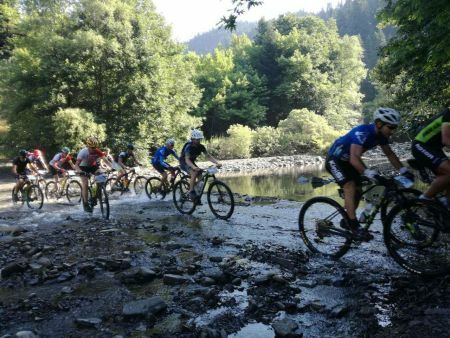 Another day of Bike Odyssey came to an end, with an intense and interest battle in the 8-days race and an amazing performance by Papasavvas and Matsoukas in the southern 3-days race, who only by a miracle seem to lose the first place in the overall ranking! On the other hand, yet another great battle took place between Pedal Force One and BikeBoard for the victory of stage 7 and the first place in the overall ranking. This time the winners were Papanikolaou and Kalogeropoulos (Pedal Force One), who raised the difference from Maciejowski and Mossoczy (BikeBoard) to seven minutes and have the upper hand on winning the blue jersey. 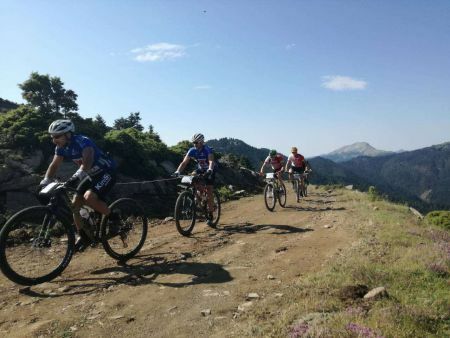 More in detail, regarding the 8-days race, with the start of the stage, a group of three was formed in the first places consisting of BikeBoard of Maciejowski and Mossoczy (BikeBoard), Papanikolaou and Kalogeropoulos of Pedal Force One, and Best Men of Tsoulouhas and Sotiriou. However, they did not stand out from the rest, and thus, at the height of the 1st check point, five teams passed by one after the other, with De Bock Wim and Loose Pieter's Ekopak Warriors 1 being in first place. They were being followed by Tsoulouhas-Sotiriou (Best Men), Papanikolaou and Kalogeropoulos of Pedal Force One, Maciejowski and Mossoczy (BikeBoard), Christou and Cole (Animal Rights), Daan De Backer and Andy Standaert (Ouzo) Azo! ), Jorgensen Lars and Larsen Bjarne (Pingel Mtb Race & Fun DK), all within seconds from one another!! Two important factors contributed to this result: due to a wind blowing as the teams rode along the Mornos Lake, no team made a big move for the first place. On the other hand, the fight was still at an early stage and, as it turned out, the main contenders for the first place in the overall ranking would slowly but steadily separate themselves from the rest. And so, the scenario of the previous races was once again repeated, and just a little before the 2nd checkpoint, Papanikolaou and Kalogeropoulos of Pedal Force One with Maciejowski and Mossoczy (BikeBoard) had climbed up, leaving the rest of the teams behind, with Pedal Force One taking a two-minutes lead from BikeBoard. Despite all the efforts of the Poles, this situation was maintained until the end, and after some ups and downs of those two teams’ difference, Pedal Force One finished in first place, four minutes ahead of BikeBoard, taking their third victory in seven stages, and increasing the difference in the overall ranking to seven minutes. Christou and Cole (Animal Rights) won once again third place, six minutes behind their front runners. Daan De Backer and Andy Standaert (Ouzo? Azo!) were following only seconds behind and finished in fourth place, having however their own battle against Best Men of Tsoulouhas and Sotiriou. After the breaking of the original group, these two teams were moving alongside, with Best Men being in fourth place and Ouzo? Azo! in fifth place, while riding pretty close to Animal Rights. The Belgians made it gradually to fourth place just before the 3rd checkpoint and even threatened Animal Rights for claiming third place. At the same time, Best Men were following right behind them, without letting those two teams create a big difference from their own position. This continuous hunt of those three teams lasted until the very end, with none of the three succeeding in taking a clear lead ahead of the others, thus Christou and Cole (Animal Rights) finished in third place, Daan De Backer and Andy Standaert (Ouzo? Azo!) won fourth place and Best Men of Toulouhas and Sotiriou finished in fifth place. Three minutes later sixth place was taken by Jorgensen Lars and Larsen Bjarne (Pingel Mtb Race & Fun DK). In the southern 3-days race Papasavvas and Matsoukas (Sinetairoi) were the winners for the second consecutive stage making another hegemonic appearance. The leaders of the southern 3-days race took an early lead that gradually grew throughout the race. This way, they crossed the finish line in first place(ahead even of the 8-days athletes), expanding the difference from second place for the overall ranking and they seem like they cannot lose unless some sort of miracle occurs. West Bikers of Rizos and Tabaropoulos went up to second place not only from the get go but also for the biggest part of the race. 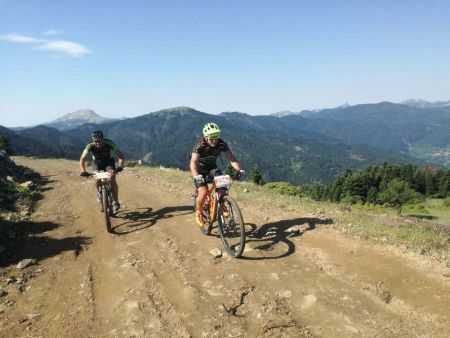 Shortly before the third checkpoint, Mauden Hill Cycling of Perdkaris and Tsoharas reached and surpassed them, but they did not manage to create a big difference for their own benefit. For a long time since that point on the two teams were riding along with a split second difference from one another! Eventually West Bikers regained the lead somewhere between the 3rd checkpoint and the finish line, winning second place with just a minute's difference from their hunters, giving a strong battle for the positions two and three! This way, the 7th day of Bike Odyssey 2018 was completed. Now the race is literally entering its final stage and we all look forward to finding out the winner of this really exciting battle between Pedal Force One and BikeBoard. Who will be the winner of the blue jersey? For more developments stand by on our website.